Organic Ice Cream Market size was than USD 850 million in 2016 and consumption is predicted to surpass 245 kilotons by 2024. Continuing consumer preference towards natural based food products along with increasing prevalence towards health safety will drive organic ice cream market growth. Global organic industry has registered over USD 86 billion in 2016 and is set to see significant growth in the coming years. Growing organic product consumption among millennials due to increased preference for healthy products even at premium prices will stimulate demand. Global ice cream spending was over USD 55 billion and consumption surpassed 23 billion liters in 2016 with China and the U.S. being the largest consumers. Annually, China surpassed 6-billion-liter consumption in 2016. However, the U.S. is predicted to remain dominating the global organic ice cream demand. Rising product usage for preparing other products including shakes, brownies and smoothies are opening new avenues for organic ice cream market expansion. Increasing consumer acceptance for homemade ice cream due to presence of extensive distribution platforms will positively influence organic ice cream market growth. Grocery retail outlets expansion due to positive FDI policies in Brazil, India, China, New Zealand, and Australia will propel product demand. Stringent regulations including the U.S. Code of Federal Regulations, pertaining to food product specification will promote demand. The regulations are focused on standardizing ice cream ingredients for balancing protein, fat, and sugar level. Limited availability of organic milk along with high price will continue to impact profitability. Product innovation including non-dairy organic ice cream production consisting coconut and almond milk will open new avenues & scope in the industry. Take home was among the leading product segment accounted for over 50% of the global organic ice cream market share in 2016. High demand from families owing to its multi serving convenience for occasions and gathering fueled product demand. Product usage in preparing cakes and sorbets has positively enhanced product demand in on trade food segment. Impulse ice cream will witness highest growth increasing at over 3.5% up to 2024. Children are the major consumer in this segment. Product innovation in terms of flavors and design at competitive prices are among the key strategies in stimulating demand. Cones, sandwiches, bars, and ice popsicles are major product types. Artisanal ice cream will generate over USD 350 million by 2024. Factors such as handmade production process using fresh and natural ingredients are driving product demand. Cream accounted for over USD 0.37 billion of the overall ingredient segment in 2016. Benefits including prevention from milk allergies, improved viscosity, better foam stability, and availability at competitive price are key properties. Whole milk leads the ingredient segment and accounted for over 22% of the organic ice cream market share in 2016. Shift of several product manufacturers towards whole milk usage is expected to witness an upsurge in demand due to increasing dietary recommendations. These recommendations usually guide people to eat fat free or low-fat products in place of high calorie fat options. Other key ingredients include stevia, egg yolks, stabilizers, emulsifiers, and natural flavoring agents. Vanilla accounted for more than 29% of the overall demand in 2016. Rising consumer outlook for pure and all natural ingredients have promoted global food manufacturers to use pure vanilla in recent years. Chocolate flavor industry will observe high growth due to growing awareness among consumers towards health benefits of cocoa rich chocolates. This trend is expected to propel the acceptance of chocolate based products. Popularity of dark chocolate is anticipated to rise due to the fact that it benefits in preventing cardiac diseases. Other majorly consumed flavors are butter pecan, mint chocolate, black raspberry, and strawberry. 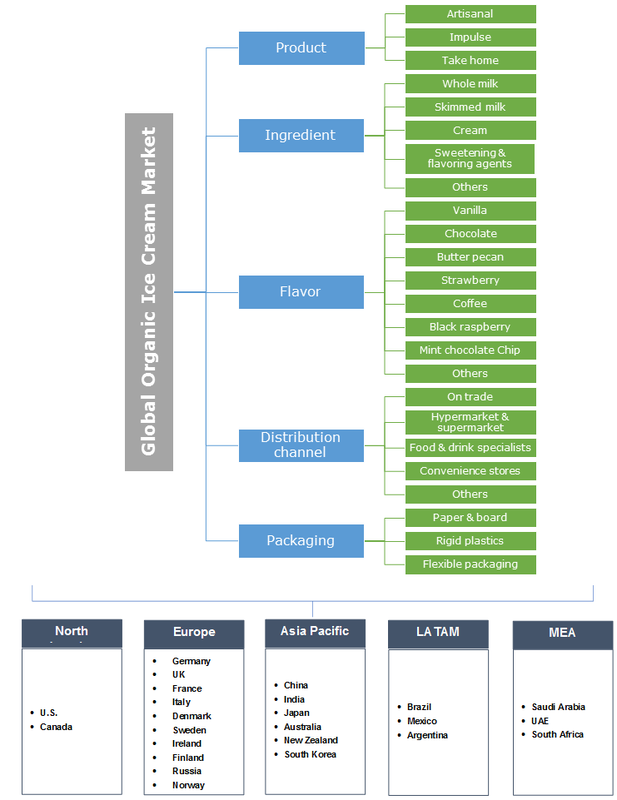 On trade distribution accounted for over 60% of the global organic ice cream market share in 2016. Businesses including parlors, restaurants and hotels are growing deliberately due to increasing after meal dessert trends among the consumers. Several other major distribution channels include supermarkets & hypermarkets, independent retailers, specialist stores and convenience stores. Supermarkets & hypermarkets will witness highest gains. Small retail businesses including convenience stores will observe significant growth as they are easy to approach by the customers when they are at a gas station or grocery shop. Rising trend for 24 hours opening facilities or wending machines will facilitate product demand. Rigid plastics packaging is the fastest growing packaging segment owing to superior product features including high impact strength convenience with attractive labeling prints. High possibilities for packaging decoration and offering aesthetic appearance are key offered benefits. Bag, tub and wrapper are key attractive packaging. Among these, tub is expected to acquire the preference due to ease in carrying and storage feature. Recycling is one of the key growth factor as most of rigid plastics packaging are made from a single material. 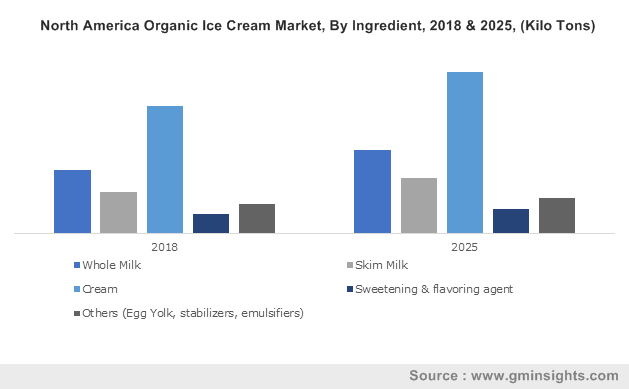 North America organic ice cream market, led by the U.S. will surpass USD 0.51 billion by 2024. Increasing consumer health consciousness, growing number of diabetics and heart disease patients is driving consumer towards naturally resourced products. Asia Pacific will witness significant gains over the forecast period. Increase in per capita income along with rising consumer spending for premium products will drive regional growth. New Zealand and Australia are among the key contributing countries owing to their high. As of 2015, New Zealand and Australia observed 28.4 and 18.1 per capita ice cream consumption in liter/yr. EU is the largest exporter due to effective presence of high quality production standards and infrastructure. Germany, Belgium, France, Italy, Netherlands, Spain, Hungary, Poland, Sweden and UK are the biggest contributor. Technological advancement in terms of cold chain infrastructure transport, commercial refrigerators, freezing equipment will drive regional industry growth. Global organic ice cream market share is fragmented and at growing stage. Most of the key players have been exploring new product launches, mergers and acquisition to enhance profitability and geographical presence. Key industry players include Mars, Nestle, Blue Bell, Lotte Confectionary, Amul, Unilever, Mikawaya, Dean Foods, Grupo Lala, Straus Family Creamery, China Mengniu Dairy, Weight Watchers International, Bliss Unlimited, So Delicious Dairy Free, Yili Group, Tillamook, Friesland Campina and Vadilal. The industry is highly dependent on consumer preferences as it takes time and better understanding for consumers to shift towards naturally produced food items. Growth in health consciousness majorly contribute for the upsurge in product sales due to change in eating habits towards better options over the forecasted period. Rise in dairies across the world will drive industry growth as raw material for production requires inherently natural resources acquired through manual labor. The product revolutionaries the organic ice cream market with improved biological ingredients, promoting environmental balance as well as conserve biodiversity.